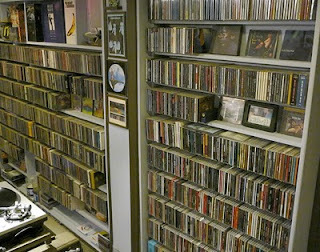 Welcome to the official blog of Metrowax Records. Topics here will include crate digging, record collecting, record prices, buying and selling records, and commentary about the music industry, past and present. Do you have a studio that's so awesome you just have to show it off? Metrowax Records wants to see it! Entries will be judged on appearance, functionality, and creativity, with bonus points given to studios dedicated purely to vinyl records. The photo clarity will play a part as well - if it's a bogus photo then it's hard to show it off to the world. Honorable mention will go to the 4th and 5th place studios. We can't wait to see these! 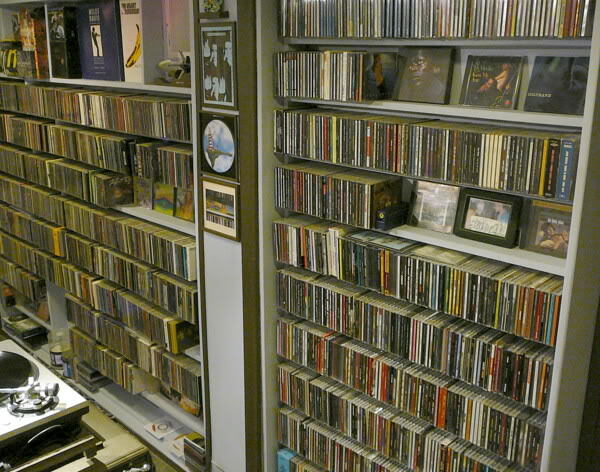 We'd like to thank Rchecka for submitting pictures of his studio. He is exempt from this competition, but he does set the bar pretty high. The beer holder is definitely a nice touch, though fans of the 40 oz. are out of luck. Here's another sweet studio setup I found on the back of a record cover from the late 1980's. Nobody would ever guess which record this is. But I will drop a hint: It's from our home state, Wisconsin! Can I have the plans for the 40 oz. beer holder? I get kinda sloppy when I'm mixing with my 40 and I don't wanna spill it on my decks. Nice one. If you're peepin these pics, you should check a book we did a little while back, "Behind the Beat", out through Gingko Press. We are currently working on volume 2, and it promises to be bigger and better than the first. Anotehr great publication is a japanese mag called "DJs Bedroom". Peace out. ^LOL! Sure thing! As a man who drinks beer and mixes at the same time, I can relate. I'll put the plans up above in a short blog in a few minutes. 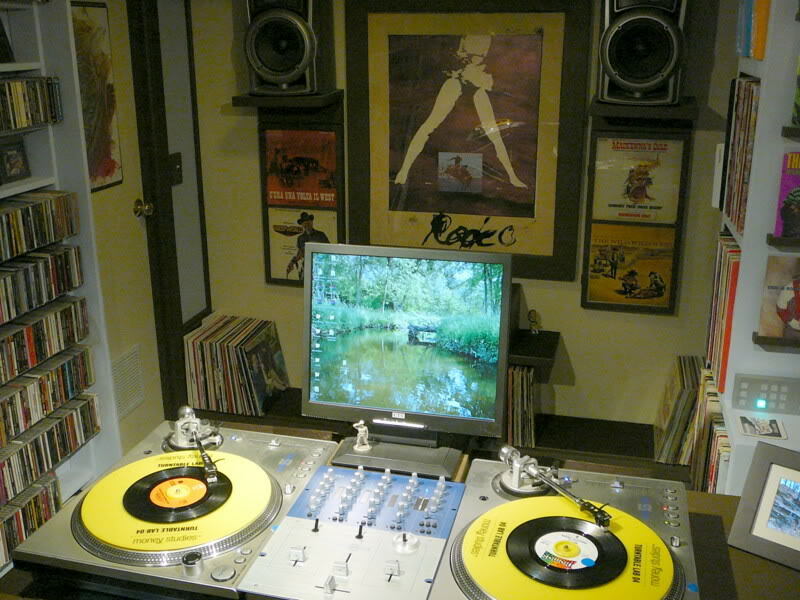 We need some more pictures of studios and DJ setups! It can be just 2 turntables and a microphone. 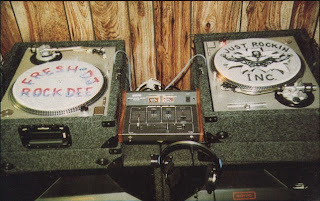 Two tape decks. 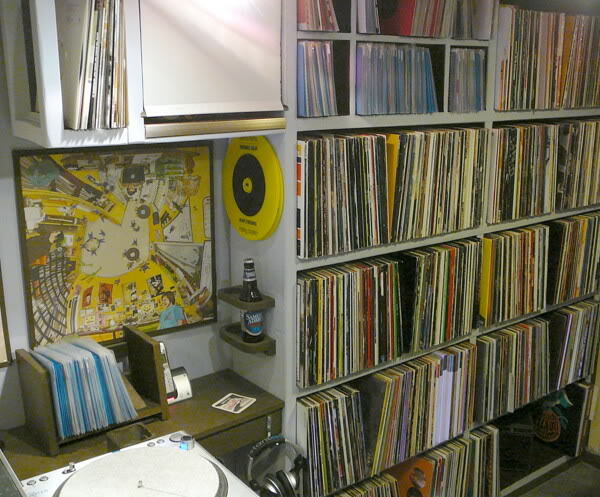 A home stereo with a few records next to it. If it is a studio, it does not have to be to the level of rchecka's, or Dr. Dre's, or anybody else. We want to see your DJ setup! Free records in our store for the winner, good luck! We are done reviewing submissions and have picked the winners! They'll be officially announced sometime this week. Just in time to use the gift certificates before Christmas! Selling the best in used and rare vinyl records since 1999. Visit our website at metrowax.com for a huge selection, low prices, and great customer service. Madvillain — “Avalanche” (Official 7-Inch Release) & New Action Figure. What happened to slow jams? Metrowax Records 2010. Simple theme. Powered by Blogger.